Coca-Cola, is a carbonated, sweetened soft drink and is the world's best-selling drink. A popular nickname for Coca-Cola is Coke. The Coca-Cola Company claims that the beverage is sold in more than 200 countries. The company's headquarters are in Atlanta, Georgia. Coca-Cola's main rival is Pepsi because of the similar taste of their main product. Coca-Cola has 7 cubes of sugar, whereas Pepsi has 8 cubes of sugar. The Coca-Cola Company is proud to have a long history of sponsoring major events, organizations and projects around the world. Among their most well known sponsorships are American Idol, Apple iTunes, BET Network, NASCAR, NBA, NCAA, and the Olympic Games. After their products were put back on sale in Myanmar in 2012, the only countries that Coca-Cola can not be bought officially are Cuba and North Korea, due to trade bans with the US. Coca-Cola was first made in the 1800s by John Pemberton. The first sales were at Jacob's Pharmacy in Atlanta, Georgia, on May 8, 1886. They sold it there for five cents a glass, it was very strong tasting because they did not mix it with water. Coca-Cola was first made the way it is now in Columbus, Georgia. It was called Pemberton's French Wine Coca at first, and was sold as a medicine to help cure colds and give people more energy. The drink used to be sold at soda fountains in the United States. It was also created to stop addictions to morphine. Coca-Cola was first sold in bottles in Atlanta on March 12, 1894 with actual cocaine content. It was first sold in cans in 1955. During the first year, sales were about only nine drinks per day. Dr. Pemberton did not think he could make a lot of money with the drink he invented, so he sold parts of his business to different people. Just before he died in 1888, he sold the rest of his Coca-Cola business to Asa G. Candler. Mr Candler, together with some other businessmen, started the Coca-Cola Company. The drink is called "Coca-Cola" because of the cocaine leaf and kola fruits that were used to add flavor. Dr. Pemberton's partner and bookkeeper, Frank Robinson, suggested the name "Coca-Cola" because he thought using the letter C twice would look better than if they used a K in the word "Cola". He then wrote down the name to use as a logo that is now very famous. The recipe was altered after a short while, swapping the cocaine leaf with the coca leaf after reported cases of hallucinations. Coca-Cola was the first ever sponsor of the Olympic Games. This was for the 1928 Olympic Games in Amsterdam. A glass of Classic Coca-Cola. World of Coca-Cola museum of Coke history. ↑ "Brand Fact Sheet". Coca-Cola official website. December 1, 2008. ↑ "In which countries is Coca-Cola not sold?". BBC News. 2012-09-11. Retrieved 2018-06-19. 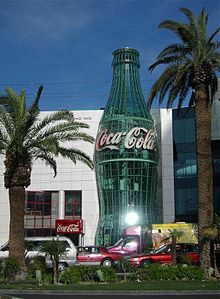 Wikimedia Commons has media related to Coca-Cola. This page was last changed on 23 March 2019, at 22:03.